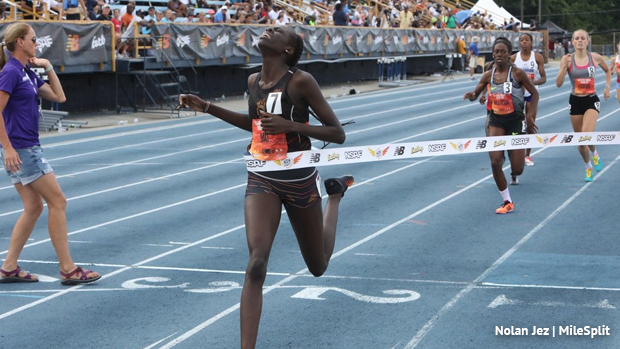 Sophomores Athing Mu of Trenton TC and Victoria Vanriele of Governor Livingston both climbed a talent ridden all-time state list with their spectacular performances on Sunday at New Balance Nationals Outdoor. With Mu's victory of 2:04.51, she moved to third all-time for New Jersey, only behind Joetta Clark-Diggs' 2:03.54 from 1979 and state record holder Ajee' Wilson's 2:00.91 from 2012. This also sets a new sophomore state record in the event, taking down the previous 2010 standard of 2:04.94 by Wilson. Mu was sitting in second for the first lap, but at 62.46 at the 400m mark she went two wide and fully took over the lead on the last turn, separating from the field en route to victory--and dropping almost three seconds off her previous outdoor best, which was a 2:07.18! She also won the New Balance Nationals Indoor title this past winter with a time of 2:06.59. That was No. 3 in New Jersey state indoor history. Vanriele finished third after overtaking some girls with a big kick over the final stretch. She ran 2:05.99 for third and is now seventh all-time in state outdoor history. This was coming off a 2:06.68 to win her fourth NJSIAA Meet of Champions title the week prior. This wasn't the first event for either of these talents either, they both raced the Emerging Elite 400m race earlier this weekend. Mu won that race running 54.12, three New Jersey girls right behind her with Aliyah Taylor second at 55.13, Khamil Evans 55.33, and Victoria Vanriele 55.46. New Jersey swept the 800m championships with a victory on the boys side as well. Luis Peralta of Passaic ran 1:49.10 just out leaning the 1:49.16 from Drew Maher of Shore Regional at the line. Safe to say New Jersey has the 800m covered.